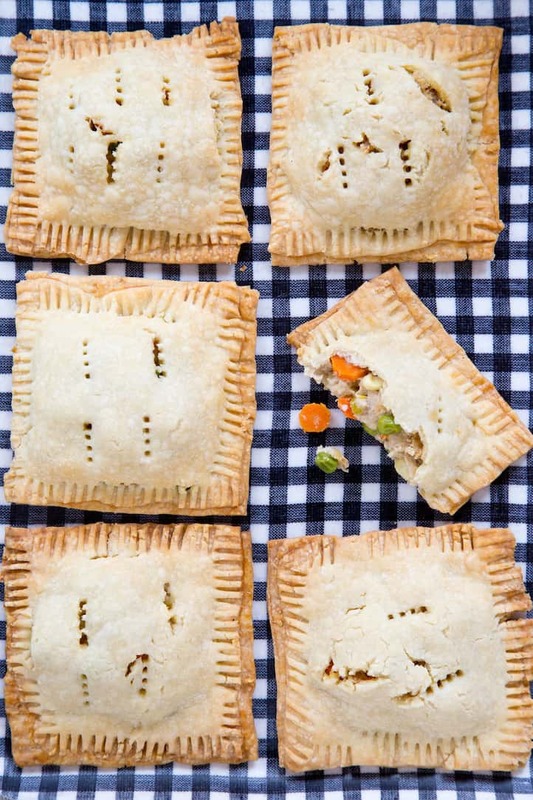 Chicken Pot Pie Pop Tarts Recipe | Good. Food. Stories. It’s always pie season around these parts. It could be cherry, it could be peach, or apple, or pecan, or especially lemon cream—if you’re making your own buttery pie crust and filling it high, chances are I’ll be grabbing a fork and heading over. However. Those who know me and my comfort food needs are all aware that even more than there’s nothing in the orchard that can compete with my love for a well-made chicken pot pie. When I say well-made, I mean a few things. There must be peas. I play it fast and loose with the vegetables I include in my pot pies, depending on the season and what’s hanging out in my kitchen—red peppers, potatoes, green beans, squash cubes, and even celery root have made occasional appearances, and even the actual chicken is negligible sometimes—but for me, it’s just not chicken pot pie without peas. The crusts must be homemade, and there must be two of them. Slapping a piece of puff pastry on top of a ramekin is just cheating. If I’m eating pot pie, it needs to have a crust on the top and one on the bottom. Hey, those are just my rules. My pot pie, my rules. I will admit that the one thing those cheating puff pastry ramekins have going for them are their size. It’s much easier to chomp down an individual serving when it’s portioned out for you rather than slicing into a big old messy round of pie, letting loose the waves of gravy and vegetable filling inside. And we’re big on individual servings here, what with our oddly-timed meal schedules and the fact that the two of us are rarely in the same room to eat the same thing at the same time. 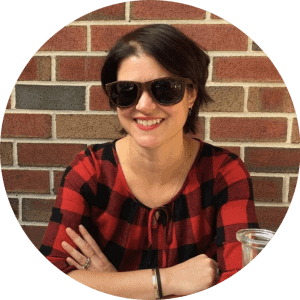 It’s those very vagaries, in fact, that inspired a series of freeze-in-advance recipes that I recently created for The Kitchn. These are foods you can make, store, and reheat in single-portion servings—you don’t necessarily have to eat them all in a single week or even in a single month. Once they’re made, they’re just there, in the freezer, ready to do your bidding. And if you’re me, and you’re thinking about pies and savory things as you roll out dough to make cheeseburger hand pies for your burger-loving husband to reheat later, your mind just might turn to pot pies instead of burgers when you dream about what you might want to eat for dinner instead. And then you come up with something like this. 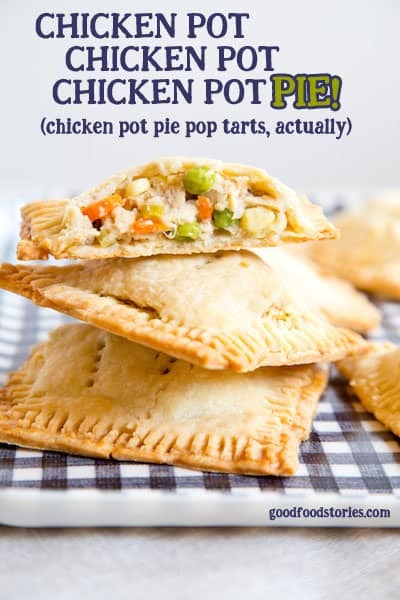 Chicken pot pie pop tarts for your future eating pleasure. Don’t be weirded out by the consistency of the filling when you prepare these. Because you need something that won’t ooze and make a mess while you assemble the individual pop tarts, I’ve devised a thicker roux gravy to keep everything in check. Once you heat the pies, the taste of the filling inside will be exactly what you want, I promise. Oh yeah, and don’t hold back. They might be single serving-sized, but there’s no law that says you can’t have more than one at a time. Heat the olive oil in a wide skillet or saute pan over medium heat. Stir in the shallot, garlic, celery, carrot, and 1/4 teaspoon salt. Cook, stirring occasionally, until the vegetables are just getting tender, about 5 minutes. Scrape the vegetables into a bowl and set aside. Melt the butter in the pan, then whisk in the flour. Cook, whisking constantly, for 5 minutes more until the flour smells nutty and turns from pale to a rich golden amber. While still whisking, add the chicken broth. Continue to cook and whisk until the mixture settles into a smooth paste. Stir in the reserved vegetables, chicken, and peas and corn. Taste and add salt and pepper as needed. Scrape the filling into a heat-safe container and refrigerate for at least 2 hours or overnight. Make the pie dough now, if you haven’t already. Preheat the oven to 350 degrees F. Line 2 large baking sheets with parchment paper or Silpat liners. On a lightly floured surface, roll one piece of pie dough into a square slightly larger than 12 inches. Use a pastry or pizza cutter and a ruler to slice the dough into 9 4-inch squares. Transfer each square to one of the prepared baking sheets and brush the edges of each square with the egg wash.
Scoop 2 tablespoons filling onto each square. Roll the remaining piece of pie dough out as you did the first, cutting it into 9 more squares. Place each of the these squares on top of the ones on the baking sheet to cover the filling, then seal the edges closed by pressing with the tines of a fork. Poke the top crust a few times with the fork to vent each pie. 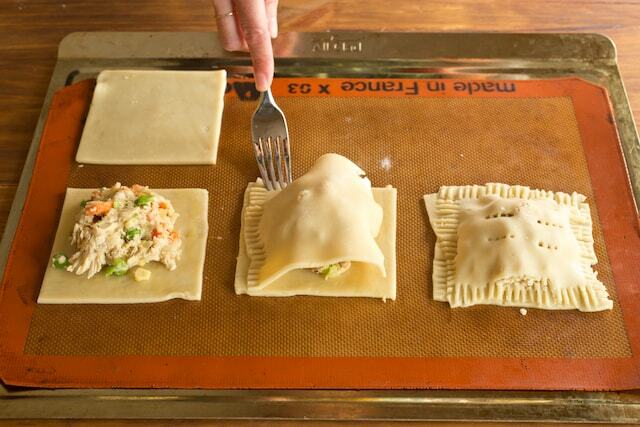 Bake for 20-25 minutes until the pot pie pop tarts are golden brown. Serve immediately, or freeze for future meals per the following instructions. Cool the baked pies to room temperature on a wire rack. Freeze the cooled pies on a waxed paper-lined baking sheet for about an hour until completely frozen through. Wrap the frozen pies in clean waxed paper and foil, or store in freezer bags up to 3 months. Reheat frozen pies in a 350-degree oven for 10 minutes.